Jack Dalrymple’s Makin’ A List. Yeah, Right. The announcement by Jack Dalrymple earlier this month that he and fellow Industrial Commission members are going to take a tour of the oil patch and develop a “list” of places where they probably shouldn’t be permitting oil development rankled some in the preservation community, and rightly so. That list pretty much already exists. Jack, just call in Merl Paaverud, Mark Zimmerman and Terry Steinwand, three of your cabinet members you probably don’t see very often, and have them bring in their lists of historic sites, parks, and wildlife areas in western North Dakota. There you go. Mark’s list probably has the national park on it as well as his state parks. Merl’s list has his state historic sites on it, as well as areas on the National Register of Historic Places, since he’s the State Historic Preservation Officer. Terry has his own wildlife management areas, state school lands which have significant wildlife habitat areas, and the national wildlife refuges. And they likely all have some “unofficial” places—culturally, historically or environmentally significant areas—they’d prefer not to be disturbed by drilling rigs and a thousand fracking trucks. I bet they’d welcome the chance to tell you about them. Finally, the Tribes have their own historic preservation officers and conservation officers. Make sure that Merl, Mark and Terry are talking to them pretty often these days. Their lists are probably the most important of all. The Bismarck Tribune story about all this says the idea of making a list of protected places comes from a suggestion by Attorney General Wayne Stenehjem, who brought it up at a meeting in January. Well, maybe. That was January. This is May. My guess is that someone probably told Stenehjem, and Dalrymple and Agriculture Commissioner Doug Goehring, that their cabinet guys already had that list. So nothing happened. Too late. The bloggers and the newspapers and the TV stations got hold of it, and pretty quickly the proposal was withdrawn. Temporarily, at least. XTO Energy, the company proposing the well site, paid good money for that lease, and they’re going to get that oil somehow. Stay tuned. Oh, probably the Killdeer Mountain Battlefield and the Little Missouri State Park are on one of those lists too. Too late for them, though. Drilling is underway there. On sites approved by the Industrial Commission. 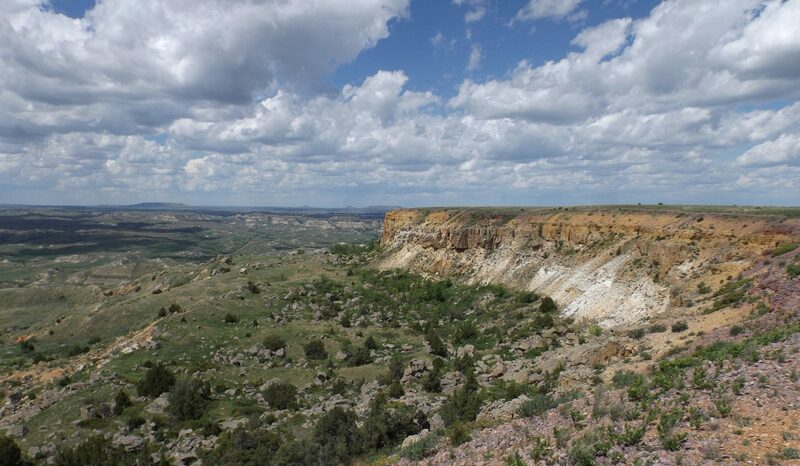 In early April, a loose coalition of groups dedicated to the protection of the Elkhorn Ranch and Theodore Roosevelt National Park wrote to the Industrial Commission expressing their concern about the near-miss at the Elkhorn. “We strongly urge you to identify special places of natural and cultural importance that are deserving of protection, like the Elkhorn Ranch and lands adjacent to Theodore Roosevelt National Park, and implement regulations to deny oil and gas development in those areas,” the group said in the letter, which was signed by the Friends of Theodore Roosevelt National Park, the Badlands Conservation Alliance, the Dakota Resource Council, the North Dakota Natural Resources Trust, the Dacotah Chapter of the Sierra Club, The Environmental Law and Policy Center, the National Trust for Historic Preservation and the National Parks Conservation Association. An impressive group. Within days, Dalrymple announced he was taking a tour. “We’re trying to make sure we’re not missing something that’s not on an existing list,” he told the Tribune. Well, you know what, there’s a list no one in state government has looked at yet. It’s a pretty short list. Only has five places on it. Five very important places, though. And it is a list that is threatened by an action that has been taken by those very same members of the Industrial Commission. A very mean-spirited action. I wrote about it last fall. In two different posts. In the first, I explained that some county commissioners in western North Dakota, led by the notorious Jim Arthaud, the same county commissioner who wants to put a bridge over the Little Missouri River next to the Elkorn Ranch, have filed a lawsuit against the United States of America seeking access to build roads on all the section lines in western North Dakota, including those in areas being protected by the United States as roadless areas of the Bad Lands. In the second, I wrote that Arthaud has been joined in that lawsuit by Jack Dalrymple and Wayne Stenehjem, on behalf of the state of North Dakota. Their goal is to open up all the closed areas to oil development. Bottom line is, there are five small areas of the Bad Lands, besides the three units of Theodore Roosevelt National Park, which have not been leased for oil development because the U.S. Forest Service, which manages them for all the People of the United States, is protecting them as “suitable for wilderness.” They are primitive areas, rich in scenery, history and wildlife, and the Forest Service has not leased the minerals under those parcels, nor have they allowed any roads to be built or any vehicle traffic inside their borders. The areas total about 60,000 acres, or about six per cent of the million acres the Forest Service owns, known as the Little Missouri National Grassland. The other 940,000 acres are leased and open for development. If the lawsuit filed by the county commissioners and Dalrymple and Stenehjem is successful, the last 60,000 acres of the Bad Lands will fall to the drillers. That means every single acre of the Bad Lands except the land inside Theodore Roosevelt National Park will be open to oil drilling. The five areas threatened by one of the most mean-spirited lawsuits ever filed by our state include Bullion Butte (you’ve read about that here before), Kendley Plateau, which is just across the Little Missouri River from Bullion, Twin Buttes, which is just northwest of Medora, and Long-X Divide and Lone Butte, on the southern and eastern boundaries of the North Unit of the Park. Those last two protect the viewshed of lookout points in the North Unit, one of the most spectacular views in the state. Those five areas are the focus of an effort to declare formal Wilderness in North Dakota. The Badlands Conservation Alliance, a group of North Dakotans who have banded together to try to keep an eye on these last few wild places in the Bad Lands, have drawn up the Prairie Legacy Wilderness plan, asking Congress to protect these last few significant areas of our state. You can read the plan by going here and clicking on the button down in the bottom left hand corner of the home page. The Dalrymple and Stenehjem and Arthaud lawsuit would negate the effect of that, declaring that the state has the right to build roads through them. There’s no good reason for the state to do that, except to kowtow to the oil industry, which wants to drill on every fracking acre of the Bad Lands. It’s outrageous that Dalrymple and Stenehjem are going to spend our state’s tax dollars, maybe millions before this is all settled, to destroy the last few unspoiled areas of our state. At the same time they are making a “list” of places to protect from oil drilling. Go figure. The lawsuit is against the People of the United States of America, represented by the U.S. Forest Service, which is doing its best to preserve these few small areas as wilderness, a place where people and critters can get together on equal terms and know that they are in a place at least protected from the dust and cacophony of drilling rigs and oil trucks. The federal government has a lot of lawyers and a lot of resources, and it is reassuring to know that there are people at all levels of government, both staff people on the ground here in the Bad Lands, and decision makers at the highest levels, who believe there are some special places worth saving. These are the same kinds of people who once decided that Yellowstone National Park and the Grand Canyon were worth saving. The Bad Lands are no less important. This week, it was good to learn that there are others joining the battle. The same Badlands Conservation Alliance (disclosure—I am a member, and my wife is the Founder) that is seeking the wilderness designation for these areas has joined forces with the federal government in defending the Bad Lands. The BCA is being represented by Earthjustice, a nationally acclaimed non-profit environmental law firm. The BCA and Earthjustice filed a motion in federal court to intervene in the lawsuit last week. Lawyers for the United States welcomed their help. Their skilled team has been involved in many major environmental lawsuits around the country. Dalrymple and Stenehjem may just have bitten off more than they can chew here. And they’re going to spend our tax dollars to find out. And if they lose, they may end up spending even more of our tax dollars paying for the good guys’ lawyers as well. The 2013 Legislature appropriated money to defend the state’s constitutional challenge to the country’s abortion laws. They probably should have appropriated even more for this one. There’s an easy out on this one. The first five stops by Dalrymple and Stenehjem and Goehring on their “summer tour” should be these five places. Then the five areas should be put on the “list” of places to be protected from oil development. The quickest and easiest way to do that would be to drop the lawsuit. And then tell Arthaud and his county commissioners to drop their lawsuit, because these areas are on the list of places where oil wells won’t be permitted anyway. If Dalrymple and Stenehjem and Goehring are sincere, that’s what they will do. Anything less is just a meaningless publicity stunt. Footnote: Here’s what a local archeologist had to say in an online post last week. I have sent e-mails to all three members of the Industrial Commission suggesting a couple of my favorite sites. Have received no reply from any of them. Great irony in the governor proclaiming he is looking for places to preserve while at the same time suing for the right to destroy those same places. The three bureaucrats you mention are all under the thumb of Lynn Helms, especially Mark Zimmerman. They will do nothing. The 2012 annual report on Little Missouri State Park does not even mention the word oil. The state tourism department just put out promotional literature on the park praising it as a paradise of wilderness camping, hiking and horseback riding. Nothing about the five drill pads, eleven wells and miles of access roads soon to be within the park and the 100+ wells in the immediate area. Paaverud caved in very meekly on the Killdeer Mountain Battlefield. He is simply hanging on until his new museum is built and he can retire. Steinwand has allowed the Killdeer Mountain Wildlife Management Area, crown jewel of the entire state system, to be drilled without a word of protest. In fact he has done his best to keep it secret. All info about the state game management areas has been removed from the department web site. If you send his department an e-mail question about this area you, like as not, will not even get a reply or if you do it will be just a minimal thank you for your interest. The professional staff of the NDGF don’t even dare talk about what they know is going on. With Duane DeKrey now installed as his political minder Mr. Steinwand will do nothing but keep his mouth shut until retirement. Keep up the rabble rousing Jim! Somebody has to tell the truth. The print and broadcast media in this state aren’t doing it. Agree with everything posted above!!!! Just have to comment on the fact that your blog is moved to back page 1st. day published!!! (coincidence??) haha The SYSTEM is so corrupted and people just do not care! The water and farm land will be forever destroyed!!!!! But like sais before keep on them Jim enjoy your contribution!!! Unfortunately, Art Link is not available for us aomrnye. We would not be having this discussion if he were. The state is in a bad situation with all of the Republican officeholders in the tower. They have placed all of their stooges, like Lynn Helms, in the proper places to issue permits as fast as they can and even if Ryan is elected, it will take years to get rid of the stooges in each agency. It is just not the agency heads (they serve at the pleasure of the Governor) that run the office’s but mainly middle managers. These people are well entrenched and the corporations lobby these middle managers as well. It will take a long time to replace them with people that want to do the right thing . Most middle managers are Classified Employees which means they can only be let go for cause .